Preserving the harvest and storing food for the winter months has always been an intrinsic part of survival. In the days before freezers, supermarkets, and ordering on the internet, it was down to the individual (usually the woman of the house) to fill the store cupboard ready for the dearth of winter. Jams, jellies, pickles, chutneys, smoking, salting, drying, canning or bottling, were all part of the cook's repertoire. 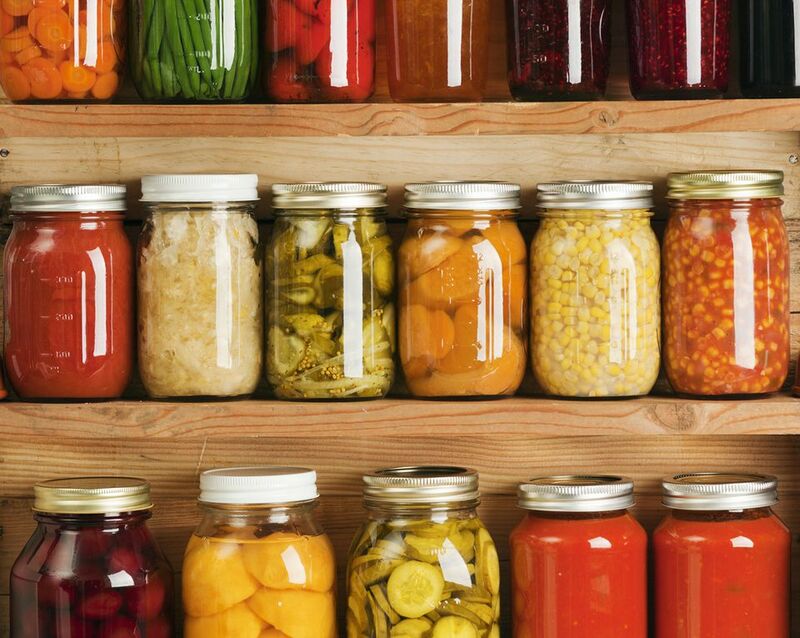 Preserving food is, for many, no longer necessary for survival, but it is a great way to stretch the budget. Preserving extends the shelf life of foods picked up cheaply and if the method used is done quickly, and correctly will often maintain the "goodness" in the produce. On the following pages are some of the most common methods of keeping foods today. Elaine Lemm. The Spruce Eats, 2016. Think of preserves and usually, the ones that first come to mind are jams, jelly, and marmalade. Who doesn't love homemade jam spread on a freshly baked scone or marmalade on a slice of toast? Making jam or jelly is an excellent way to make the most of the plentiful summer fruits, and it can be made with the minimum amount of fuss or equipment. Pickling has been a way of preserving foods for centuries. The addition of vinegar (pickling) to food acts as an antiseptic, creating an acidic environment which prevents the growth of the bacteria which spoils food. Pickled cucumbers, onions, beetroot, carrots, fish, even peaches, or other fruits, are much loved pickled foods. 100 years ago the thought of being able to freeze food in the home was unheard of and probably just a dream. In that dream, how wonderful to be able to make the most of the fresh food, meat, fish vegetables or fruits and preserve it simply and quickly for eating later, and still almost as fresh as the day it was frozen. Few foods can't be frozen, but, there are some, so always check before you do. Diana Rattray, Southern Food Expert, has great tips on freezing food including what can and can't be frozen and a time guide on freezing food. Elderflower cordials, sloe gin, syrups, and liqueurs are a method of preserving, currently enjoying a massive comeback. Some lovely drinks can be created from fruits, nuts, and flowers. There are other methods of preserving food which are not as accessible, or take longer than the ones above but are also a great way to preserve food. Smoking food is so much fun and how great to serve your own-smoked food to guests. Salting, though out of favor with many through the fear of too much salt in the diet even though most of the salt is washed away once the food is cured, is still a great way to preserve food. Ever tried making Graved Lax without it? Drying is so simple to do. Drying herbs is one of the best ways to preserve herbs for use year-round.